Since its release in summer 1994, the Message Passing Interface (MPI) specification has become a standard for message-passing libraries for parallel computations. There exist more than a dozen implementations on a variety of computing platforms, from the IBM SP-2 supercomputer to PCs running Windows NT. 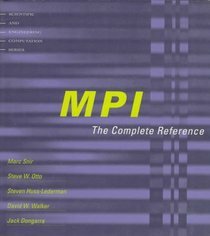 The MPI standard includes point-to-point message-passing, collective communications, group and communicator concepts, process topologies, environmental management, process cre- ation and management, one-sided communications, extended collective operations, external interfaces, I/O, some miscellaneous topics, and a profiling interface. Language bindings for C and Fortran are defined. William Gropp is Associate Division Director and Senior Computer Scientist, MCS Division, at Argonne National Laboratory.